Club Penguin Cheats by Mimo777 Club Penguin Cheats by Mimo777: Club Penguin Super Hero Party 2012 Sneak Peek! Check it out! I found some super cool photos of the Super Hero Party coming NEXT MONTH in June! I think the top pic is some sort of command room or something. And the other one looks like it may be the top of the town... Maybe? I don't even know. But what I do know is that this party is going to be sick awesome! I can't wait! What would you like to see in this party...? Cool costumes? Singing hippos? More weapons? Rockhopper in a tutu? Whatever you wanna see, I wanna hear it! Mimo, if you look on the real telescope on the top of the lighthouse, you can see a red sparkling thing! Like a ruby! I want to see more stuff for non-members! i wanna see what the town looks like! gotta be SICK! I think the top one is in the cloud city. It's looking down on the island, but town is now a city. Tasks don't have to be fighting. I am so excited! Actually, I kind of wanna see Rockhopper in a tutu listening to my brother talking about his feelings. Ha ha ha. I wanna see that Command Room! It does look epic! Where did you get those pictures! Awesome! Keep on keeping on! Rockhopper and his puffle dress as super heros!!! Can non-members buy clothes? If not is there any way for us to use our old stuff from when we were members without paying again? This was supposed to be a surprise party! U ruined the surprise....but i must tell u that its soooooo coool of u to tell us this information....i mean where else on this web we could have found this??? THANK U!! Non-members need more footwear! We've only gotten the brown pirate boots and sandals from when the Dojo reopened in the past 2 years! We have so many head items, a few body items, and no shoes to go with them! me too Aosc2.but they might just give non members a lame costume for a superhero that they made up. *sigh*why is clubpenguin giving members everything?and giving non members nothing?thats why i asked for a clubpenguin membership card for christmas last year. I wanna to see Herbert. EPF will team up with Marvel heroes and defeat Herbert and kick some Marvel butts! 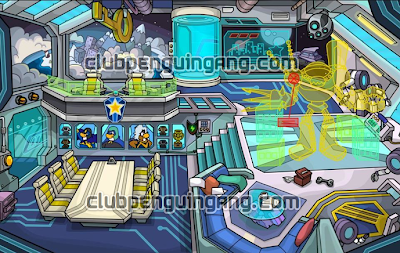 Superheroes team up with penguins and defeat Herbert! This looks really interesting to me. 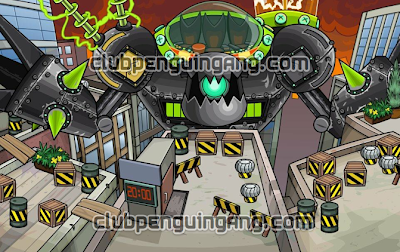 If you look in the first photo, there's a screen with three evil looking dudes, I think they will be the villains attacking CP, and in the second photo, that huge vehicle thing, it has three seats, I believe they will use that to try take over CP, then the superheroes stop then. That's my theory. (To the people who see the sparkley thing in the telescope, it's only the Beacon from the last time Rockhopper came to CP! So calm down. I got membership back just in time! I hope non-members can buy costumes, cuz it's not fair that members get it all! Friend Me! Oh by the way, I really want to see some action in this! Will we get to defeat a villian? Will we dress up and have secret tasks? That would be sick awesome. Again, even if I say sik awesome doesn't mean I'm a boy! Ha ha, anyway, other then seeing Rockhopper listening to my brother talk about his feelings, I would like to see a dancing hippo named Smochie since my dad brought it up at dinner a few days ago. Thanks! Keep on keeping on!